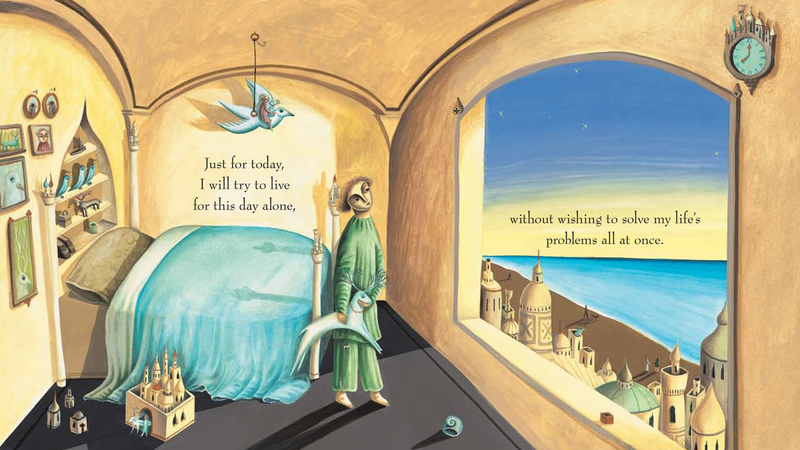 Just for today, I will try to live for this day alone, without trying to solve all my life’s problems at once. I have so many problems. Don’t you? Isn’t it frustrating how many of them are of our own making? How many of those problems, I wonder, would we be better able to deal with if only we could — by the grace of God — become clearer in our intentions and more disciplined in the way we live out those intentions daily? 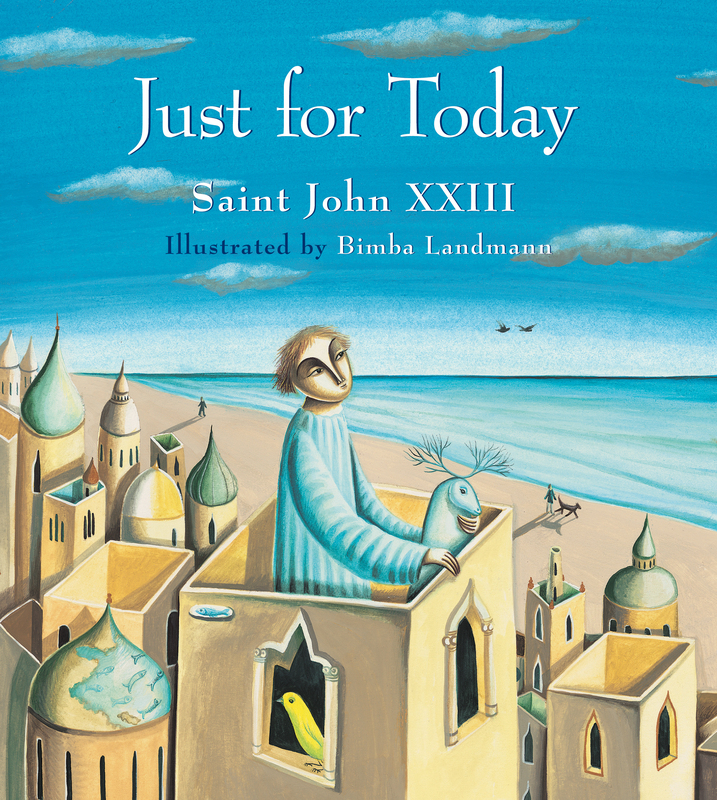 One of my very favorite Eerdmans picture books this season is Just for Today, a lovely rendition of Saint John XXIII’s “decalogue for daily living” illustrated by Bimba Landmann. As I type this, Microsoft Word keeps trying to capitalize the word “Decalogue” for me — for good reason, I suppose. “Decalogue,” after all, is another word for THE TEN COMMANDMENTS (caps mine, to indicate the big, booming voice with which I so often hear these words in my head). The Decalogue is kind of a big deal for all who, like me, count themselves as believers within the Judeo-Christian tradition, and Microsoft is generally right to want to capitalize it. In this case, however, Microsoft is wrong. John XXIII’s decalogue should remain lower case. He wrote it for himself, to help him along the way to his life’s goal: “I want always to be good to everyone.” Rather than Ten Commandments written in stone for a community numberless as the stars, these are ten beautiful intentions written for a community of two — the “good pope” and his God. I feel honored to look on. What’s more, I feel inspired — inspired to examine my own life and draft my own (lower-case) decalogue for daily living. Here, then, are my ten beautiful intentions, just for today . . .
Just for today, I will not forget to pray — at least once in the company of others; at least once when no one can hear me but God. I will turn my thoughts to God when I first wake up and when I commit myself again to sleep. Just for today, I will work diligently when it is time to work — and when it is time to rest, I will rest easy. I will not let laziness spoil my useful labor or restless ambition sour my peace. Just for today, I will take great care in what my mouth, eyes, and ears consume. I will eat and drink only those things that are wholesome for the body; I will read and watch only those things that are nourishing to the heart, mind, and soul. In all these things, I will be moderate. Just for today, I will delight in my body just as it is. I will flex my muscles, stretch my limbs, and rejoice in the movement and vitality God has given me through them. I will run — for a few moments at least — as fast as I can, without caring about who may be watching or how silly I may look. 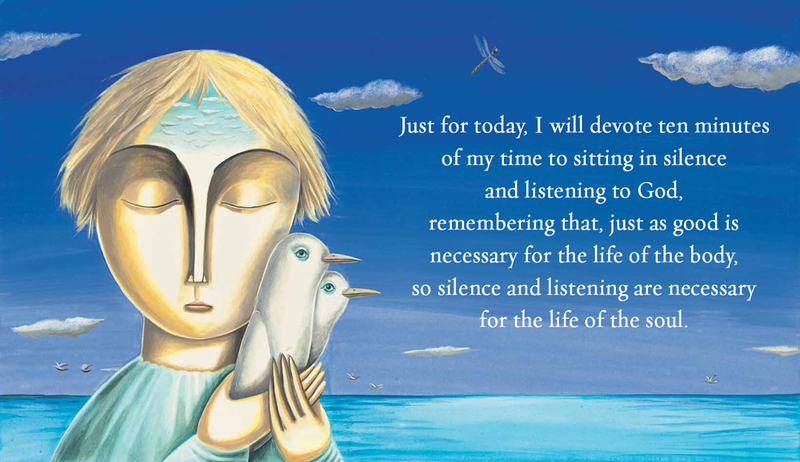 Just for today, I will devote time to silence. I will turn off all noise, set aside chores and entertainment, sit quietly, and listen only to the birds, the bugs, the breeze, and my own thoughts. Just for today, I will live in my own time. I will look neither to the past nor to the future, but will be content with the life God has given me in the now. Just for today, I will live in my own place. I will focus my gaze not on what is virtual and far away but on people and things that are real and close at hand. And I will love these things not just with abstract words and feelings but with actions. Just for today, I will speak words of encouragement that are unsullied by self-serving flattery, and I will speak words of honest criticism that are untinged by bitterness or resentment. Just for today, I will take myself out of doors as often as I can. I will walk barefoot in the grass, soak myself in the sun and the fragrant air, tend a garden (however modest it may be), and remember that I, too, am a part of God’s green earth. Just for today, I will try to see myself as God sees me: small, weak, selfish, flawed — and absolutely lovable. These are my beautiful intentions. I pray God’s grace that I may live into them — for today, at least. What about you? What are your beautiful intentions, just for today? Apt words to live by!